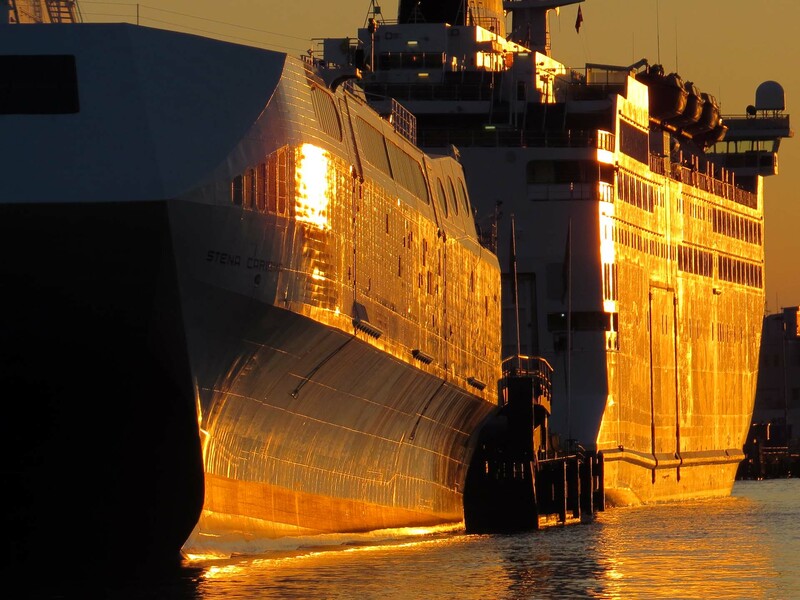 The setting sun on the white paint of these two Stena Line ferries makes them glow like polished copper. Stena Line is one of the largest ferry operators in the world, says Wikipedia. I’ve no reason to doubt. Stena was founded by Sten Allan Olsson (StenA, get it?) in Gothenburg in 1962 and the company headquarters is still here. The company livery is principally white, but in the moment this photograph captures, on 29th March 2014, the setting sun reflecting off them turns them into burnished copper. Of all my GBG365 photos this is one of my favourites. I exhibited it at Planket in 2014 and it attracted a lot of attention – especially from the technical crowd. There was also one older man who’d worked on the shipbuilding wharves back in the day. He particularly liked all the rivet heads. I’m not sure you can see them in this reproduction, but they are very distinct in the original. Stena is an important firm in Gothenburg. The Olsson family lived here during Sten’s lifetime (and for all I know still do). Once upon a time in the late 80s when I was first here, I worked as an English teacher for adult study circles. Mostly I worked with evening classes of exam students, but I also had some day circles with pensioners. One day, though, I got put in to lead a conversation circle for another teacher who was sick. The group turned out to be made up of several ladies of a very different class. One of them was Mrs Stena Line. She told me about the time she and her husband visited Mrs Thatcher at 10 Downing Street. To be fair to Mrs Olsson, it was one of her circle buddies who encouraged her to tell the story. I was not sure at the time – and I’ve never been sure since – whether the story was supposed to put me at my ease or put me in my place. At the time Margaret Thatcher was not my favourite politician (and I’ve not warmed to her since). I hope I didn’t say anything undiplomatic, but that was the first and last time I led that conversation class.